Who is Groot? He is giant tree alien monster who loves Earth so much he wants to bring us all back to study. Well at least that is how the character is first introduced in one of Marvel's early Monster books that made up the bulk of the early Marvel stories. Overtime, he has evolved from a monstrous menace into a kind, intelligent hero. Catch Phrase: " I AM GROOT"
Groot is a member of the "Modern" Guardians of Galaxy a group of super heroes who bounce around space fighting off cosmic threats. Groot starts off as a monstrous tree alien in the marvel universe. He first appears as a menacing monster from the Planet X. A heroic doctor manages to save the day by killing Groot with mutant termites. This saves the town from being hauled off to Planet X (Groots home planet) to be experimented on. This likely sounds bizarre to most people, more like a Stephen King novel than a superhero story. Groot you must understand is old and his origins go back before Spiderman and most of the Superhero Marvel Characters. In the 1950s Marvel was primarily known for releasing Monster/ Romance and Western based stories. In the late 1950s Marvel release Fantastic Four one of its first superhero books after a long hiatus from the 1940 Captain America days. The art/style/tone of Fantastic Four were widely different than what comic fans were used to and comic fans went nuts! Fantastic 4 was a massive success! Suddenly, Marvel begins creating super hero books instead of Monster/Romance and Westerns. The monsters books did not all go away and this is where you get Groot. 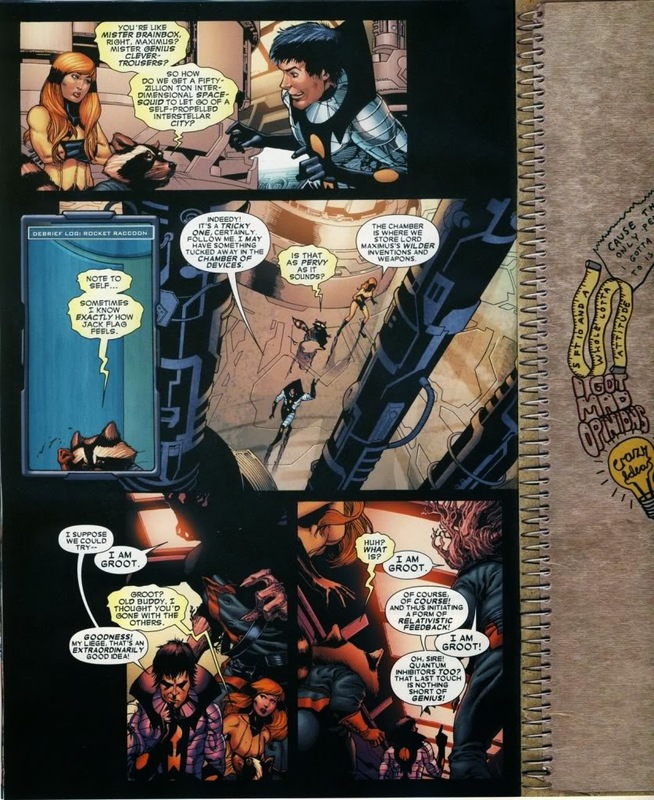 Marvel is still producing some of the books from their old genre, their old bread and butter. Groot is published in 1960 at a time where Marvel is beginning to transition away from the Monsters and to the Superheros. In that way he is kind of a Tony Soprano character who comes in at the end of an era. This is fitting because Groot is also the last of his race in the comics. After his initial monstrous appearance he comes back a few times once to battle the Hulk, once in Spiderman's nightmares. Finally, decades after being introduced he begins to evolve into a hero in the book Howling Commandos. Groot is captured by Shield and is added to a paranormal Shield group called the Howling Commandos. The howling commandos are basically monsters given a chance to form a superhero team. This is where he begins to evolve from a monster to a hero. Groot makes his next big appearance as part of the Annihilation Conquest storyline. He heroically sacrifices himself to blow up a tower. Rocket Raccoon saves a small part of Groot and Groot is able to regenerate from that small piece. It must be nice to be a tree. From that time on Groot is in the Guardians of the Galaxy or as he likes to refer to the team "Groot and Branches." By this time he is believed to be the last member of his race. As he and Rocket Raccoon are the only members of their kind they become kindred spirits. Groot constantly says "I am Groot." This makes him seem stupid however he is actually extremely intelligent. Perhaps, the most intelligent member of Guardians of the Galaxy by far infact. He received a spectactular education through his elite royal household on his home world. Its thought he may have had one of the finest educations in the universe. 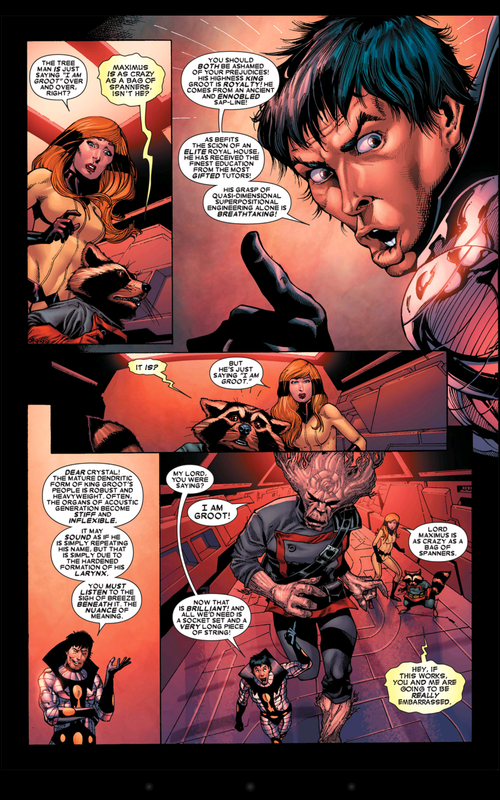 This is explained by the Inhuman character Maximus Mad who is one of the few characters able to understand what Groot is actually saying. The crazy genius Maximus the Mad asserts that when Groot says "I am Groot" he could actually be saying an innumerable amount of things. The vocal restrictions of his larynx inhibit him from speaking more clearly and other species can not catch the subtleties of his speech. He can regrow himself, regenerate from a small twig or cutting. He has regenerated himself in this manner at least 3 times in the comics. Groot appears in the Guardians of the Galaxy movie and is voiced by actor, Vin Diesel. True to comic form Groot only says "I am Groot" in the film with one slight nuance at the end. James Gunn has said that if Rocket Raccoon is the heart of the movie, then Groot is its soul. Learn about more characters and the Guardians of the Galaxy! bio, Captain Americas Shield, Charlie, comics, Groot, Guardians of the Galaxy, I AM GROOT, Marvel, modern, movie, Rocket, Rocket Raccoon, Sentient, Tree, Vin Diesel, Who is Groot?